Sustainability is a broad topic with deep engagement in a variety of industries, though it is a relatively new conversation in cannabis. That said, in today’s rapidly scaling and globalizing market, intelligent cannabis investors and operators are beginning to contemplate how sustainability can add value to their ventures. Personally, after two decades of sustainability experience in a variety of industries, I prefer the term “resource efficiency” over sustainability because it is more clear and ties directly to the bottom line. With impeccable timing given the state of today’s competitive market, Arcview hosted the first major cannabis investor discussion on sustainability a few weeks ago in San Francisco. I was honored to speak alongside Emily Paxhia of Poseidon, Frederick Schilling of Klersun and Francis Priznar of Arcview. Energy expenses generally range from 25 to 50 percent of an overall cost structure of a cultivation operation that incorporates controlled environments (indoor or greenhouse). I recommend starting there. 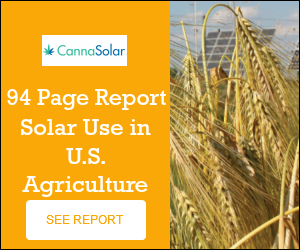 We at the non-profit Resource Innovation Institute created a free, peer-reviewed energy benchmarking tool called the Cannabis PowerScore to point the way to an efficient industry future. More than 100 cultivation facility operators have contributed data about their energy consumption, technology use and production output. In return, they receive an instant benchmark that compares their energy performance to their peers, while identifying operational weak points and resources to drive energy savings. All farm-identifiable data is kept confidential. Resource Innovation Institute then uses the aggregate, anonymous data to inform governments, utilities and manufacturers how to shape policies, incentives and R&D to drive conservation and establish industry standards. In essence, we are playing a role much like the federal government does with the Energy Star label. It’s critical that industry leaders take an initial step toward sustainability not just for their own benefit, but also to enable the industry to establish baselines and figure out the most efficient pathways forward so that geographies know how to compete in the global marketplace. We need to move away from our history of secrecy and elevate crowdsourced best practices. We can only do this through objective analysis of data. After all, literally no one knows with a significant level of confidence how to optimize efficient techniques and technologies across a range of cultivation settings and climate zones. For example, running an efficient operation in Arizona is vastly different than doing so in Massachusetts. Last week, we announced that RII will produce a Cannabis Energy Report in partnership with New Frontier Data and Scale Microgrid Solutions. This groundbreaking report will be the definitive guide to support investors, operators, policymakers and others to make decisions on how best to create a profitable, resource efficient future for cannabis. The analysis will be based on the crowdsourced Cannabis PowerScore data. Start your sustainability journey and get your instant energy performance benchmark by encouraging one of your team members to invest a few minutes engaging with the Cannabis PowerScore. If you participate by August 31, your data will be incorporated into the analysis for the Cannabis Energy Report and will give you the best understanding of how competitive your facility is. With your valuable input, we can simultaneously chart the best course for industry efficiency and help boost your bottom line.